Mix the bread crumbs with mayonnaise and cheese. Mix until it is a thick paste then blend coriander in. Make a horizontal slice in the pork chops, do not cut right through. Stuff pork chops with the filling. Mix together olive oil, lemon juice and Dijon mustard. 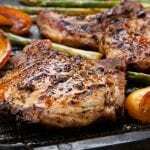 Braai the chops over medium coals until cooked through while basting constantly with oil mixture. Serve with braai mielies and salad.